There are two main types of fields which act on the charged particles: electric and magnetic. In our acceleration in the electric field calculator we have focused on the former. If you want to learn more about the latter, check out our Lorentz Force Calculator. In the text below, we explain what is the force acting on the charged particle in the electric field and how you can compute the acceleration of this particle. One of the fundamental forces of nature, the electromagnetic force, consists of the electric and the magnetic field. On one hand, the electric field always acts on the charged particle, and on the other hand, the magnetic field acts only when this particle is moving. The magnitude of force F which is exerted on the charged particle in the electric field E can be described with the Coulomb's law. It states that F = q * E, where q is the charge of the particle. You can see that particles with the higher charge will always be attracted (or repelled) stronger. E is the electric field. The default weight unit and charge unit used in our calculator is respectively the weight me = 9.1 * 10^31 kg and the charge e = 1.6 * 10^(-19) C of a single electron. The above equation can be easily derived from Newton's second law: F = m * a. We just have to combine it with the electrostatic force F = q * E described in the previous section. What is the magnitude of the acceleration of an electron in a typical electric field? Is it similar to the gravitational force of our Earth? Let's check it with our calculator assuming that we have the electron with the mass me and charge e in the relatively weak electric field E = 1 N/C. The result is astonishing! Electron accelerates almost 20 billion times faster than the average acceleration of gravity on Earth. 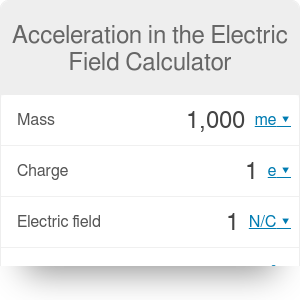 Acceleration in the Electric Field Calculator can be embedded on your website to enrich the content you wrote and make it easier for your visitors to understand your message.